My interest in bats was born in 2014 when I volunteered for a project to study the drivers of roost choice among cave roosting bats in southeastern Nigeria. This project had a community conservation education aspect that meant I had to read up on the ecosystem services of bats. I was fascinated about how critical bats are in maintaining ecosystem stability. This completely matches my life-long love for conservation, having acquired a BSc and MSc degrees in Zoology and Environmental Quality Management respectively. However, it wasn’t until I caught two individuals of the powder dusted Cyclops leaf-nosed bat (Hipposideros cyclops), about a week into the study that I made up my mind about bats. That was the turning point, I knew I wanted to do that over and again. I spent the next 2 years studying insectivorous bats in Eastern Nigeria, investigating what drives their roost choice and the direct conservation implications of these findings. In this time, I and my bat research team have been engaging local communities in bat conservation education programs to reduce bat-human conflict in Southern Nigeria where bats face so many pressures. My research interest lies in the field of conservation ecology. 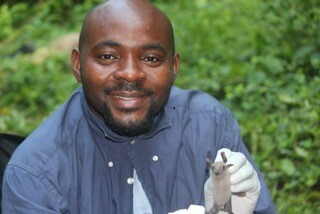 Currently, I’m seeking to understand how hunting affects the massively hunted Egyptian fruit bat (Rousettus aegyptiacus) in terms of population and genetic diversity in Southern Nigeria, and how having a localized understanding of the ecosystem services of this species could be incorporated into a community driven conservation plan. To design an effective mitigation plan, this study will also answer questions on what specific factors drive bat hunting in this region.